The law dealing with Possession of Marijuana, Possession of Hashish Oil and Possession of THC Oil can be complex and the available defenses can vary widely depending on the particular facts and circumstances of your case. Although every case presents its own unique facts and circumstances, there are some defenses that are common to these types of Possession offenses. Knowledge Defense – In order to establish possession, the prosecutor must prove that our client had knowledge of the presence of the contraband. While this element of the offense can be easily established if the substance is located in our client’s hand or pants pocket, a defense of “lack of knowledge” may be appropriate where the contraband is located in a jointly occupied vehicle or in a scenario where the substances are found in a closed container such as a bag, suitcase, glovebox or center console. Chemistry Defense – In some cases, a substance that law enforcement initially believed to be marijuana, THC resin, or Hashish Oil is later determined not to be illicit substance through testing on a Gas Chromatograph Mass Spectrometer. Prescription Defense – Effective in 2017, Florida adopted a compassionate use policy that allows individuals to obtain a prescription for medical marijuana. As a result, if our client had a prescription for the substance that he or she possessed, it is very likely that he or she has an absolute defense to the charge. Under the current state of the law, marijuana may not be “smoked.” As a result, it is common that prescription defenses occur in cases involving Possession of Cannabis Resin, Possession of THC Oil and Possession of Hashish Oil. It is very common for prosecutors in Pinellas County to seek a sentence that includes random drug testing, a substance abuse evaluation and counseling or treatment. Florida law likewise requires a mandatory one-year driver’s license revocation upon conviction for any Possession of Marijuana offense. It is not uncommon for the prosecutor to suggest to the Judge that some jail time is appropriate if the individual’s criminal record reflects a prior conviction for drug possession, cultivation, or sale. In felony cases, where the facts are aggravated or the individual’s criminal punishment code “scoresheet” requires, the State will seek a prison sentence in the Florida Department of Corrections. Getting the Charge Dismissed:We can make formal application for your participation in a “diversion program.” Your successful completion of this program would result in the judge dismissing the charge against you. Plea Bargains:We can provide facts and mitigating evidence to the judge in the best possible light. In some cases, we direct clients to prepare for court by completing certain tasks in anticipation of their court hearing. This preparation and presentation can often lead to plea bargains that achieve the best possible outcome. Avoiding Conviction:We can negotiate with the prosecutor and the court in an effort to secure a “withhold of adjudication.” This type of disposition would avoid a formal conviction. 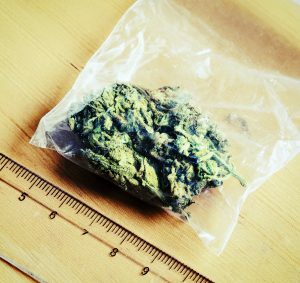 Resolving your possession of marijuana charge by securing a withhold of adjudication could be highly beneficial. You could thereafter truthfully state that you were not convicted of this drug offense. Furthermore, this would allow you to avoid the suspension of your driving privilege that would otherwise be imposed if you were to be formally convicted. Getting Your Records Sealed:At the conclusion of your case, we can petition the court to seal or expunge all of the records related to your arrest. In most cases this would give you the right to truthfully state that you had never even been arrested or charged with the offense. There are many important distinctions in the law governing possession of marijuana cases. You need the advice of an experienced and knowledgeable attorney who can evaluate the law and the unique set of facts in your case. We can help! If you have been charged with Possession of Marijuana, Possession of Cannabis Resin, Possession of THC Oil, or Possession of Hashish Oil, call our office at 727-578-0303 for a free consultation. Our team of top-rated criminal defense attorneys frequently represent clients in St. Petersburg, Clearwater, Tarpon Springs, Palm Harbor, Dunedin, Belleair, Safety Harbor, Oldsmar, Pinellas Park, Kenneth City, Largo, Gulfport, Treasure Island, Indian Shores, Indian Rocks, Redington Shores, Madeira Beach, Tierra Verde and St. Pete Beach.